Hotel Overview The hotel is situated in the heart of Varna, Bulgaria and offers a perfect opportunities for relaxation and business. 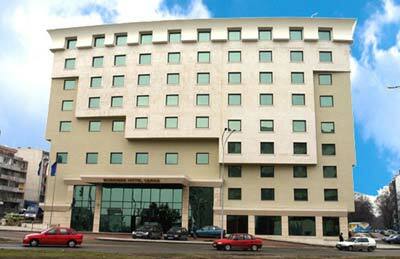 Business Hotel Varna offers to its guests 79 double, 12 single rooms, 4 apartments and 1 apartment deluxe. Facilities Hotel and room facilities of Business Hotel Varna - point the mouse over an image to see the meaning. Hotel, Restaurant, Hight club, Congress center, Internet access, Fitness, Sauna, Balneology, Exchange, Credit cards welcome. 2 conference halls with 100 and 30 seats, appropriate for conferences, presentations, seminars, business meetings and private parties. I need a smoking double deluxe room from today 24.of june till 30.of june . i can not book tihs condition in your system. Hallo, will you please confirm, that I did make a reservations yesterday, 1 dobbelt-room and 2 single-room. Please confirm now!!!!!! !